I’ve got a long torso for my height to begin with, so much to my irritation even maternity tops start to get a bit short on me by the third trimester. This round, I’ve been making the Patterns for Pirates Free Spirit Tank. As a note, this is not a maternity pattern. I’ve made three of these, and I cut the handkerchief hem variation of the pattern in a size XL based on my bust measurement. When I’ve cut it as the handkerchief hem, I’ve added two or three inches to the very front section’s length. When I did this variation, I cut it at around 3/4 of the way down the handkerchief hem, and slightly narrower on the fronts, as I was trying to make the most of some leftover feather fabric from some other projects. 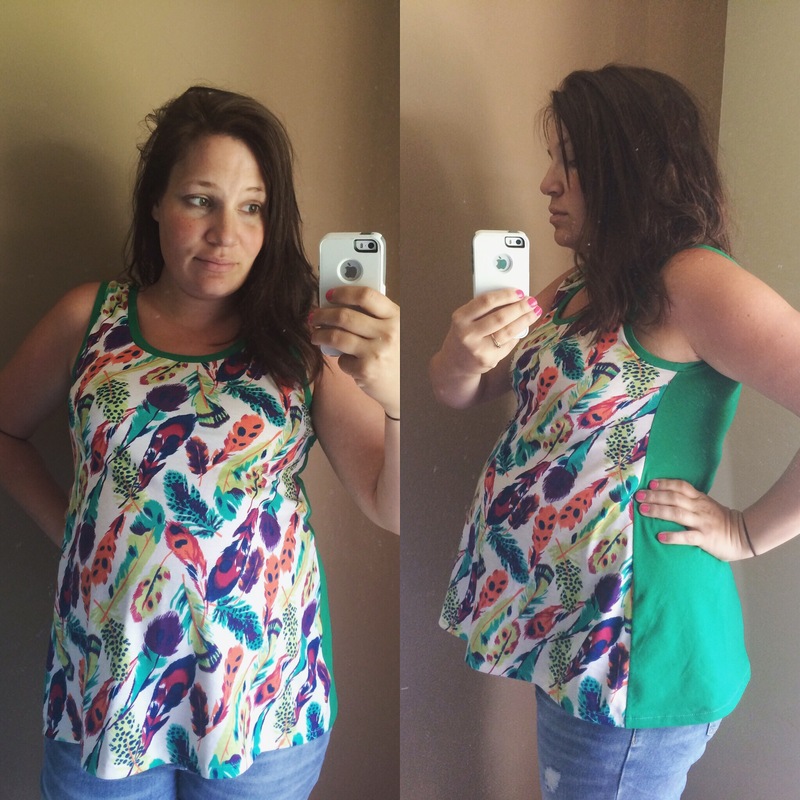 My favourite part of the Free Spirit Tank as a maternity top is that it looks universally flattering on everyone I’ve seen it on. It will flow over the floppy gut of self-esteem-destruction aka Empty Baby House Tummy postpartum, and I will look put together instead of like I dragged myself reluctantly out of the house. Or at least my shirt will look cute and distract from my unbrushed hair. Here’s a test… Did you notice my unbrushed hair in the above picture? This is why I’m not a professional blogger.